NIPCCD Answer Key 2019: National Institute of Public Cooperation & Child Development NIPCCD scheduled to conduct examination on 15th and 16th April 2019 for Joint Director/ Regional Director, Deputy Director, Assistant Director, Publication Officer, Assistant Admn. Officer, Research Assistant, Assistant. The Written Examination was held on 15.04.2019 to 16.04.2019. 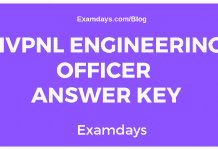 Those who are given the examination can download Answer Key 2019. Name of the Exam: Joint Director/ Regional Director, Deputy Director, Assistant Director, Publication Officer, Assistant Admn. Officer, Research Assistant, Assistant. Exam Date: 15.04.2019 to 16.04.2019. Those who are given the examination can download the NIPCCD Answer Key (Available Soon).